Red Mansions, by Cynthia Drew, is a historical novel about three generations of strong and determined women in New York City during the 1920s and ’30s. While it is the second novel in a series, Red Mansions can be read as a stand-alone novel. This well-told tale of the decades between World Wars I and II will encourage the reader to seek out the first novel in the series, City of Slaughter, to better understand the life of its protagonist, Carsie. The Nussbaums are a Jewish family living in a red brick mansion on New York City’s Upper East Side, a family whose fortune rises and falls during the Roaring Twenties and the Great Depression. The story is anchored by appearances of real-life society matrons, gangsters, fashion designers, and artists. Carsie and her sister, Lilia, escape from Eastern Europe during the onset of World War I and settle in New York City, where Lilia marries Louis Levy and Carsie learns the millinery trade to support herself. After Lilia’s death, Carsie and Louis wed and have two children. Louis soon goes off to war and is reported killed, leaving Carsie to raise their two daughters. Carsie marries the adoring Chat Nussbaum, who adopts the two girls as his own. The Nussbaums create a wonderful life until Carsie’s first husband returns from war, after a year during which he was (supposedly) buried and was mourned by family and friends. Louis Levy brings a mountain of trouble with him, and Carsie’s world begins to crash around her. A family train trip to Chicago to visit Chat’s parents riles his mother, Estelle Nussbaum, the unyielding and protective matriarch who refuses to welcome Carsie and her daughters into the family. Estelle’s comeuppance arrives when she loses her husband and her fortune and only thinks she is hiding this fact from Carsie and the world. 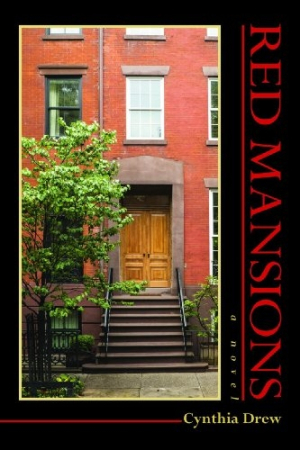 After reading Red Mansions, readers living in or visiting New York City may look with new eyes at the red brick buildings that once housed single families. Social issues, prejudice, women’s rights, reproductive freedom, and love are the themes woven through Red Mansions, a great read for adults as well as those coming of age and trying to understand the restrictions their parents place upon them in the name of familial love and safety.